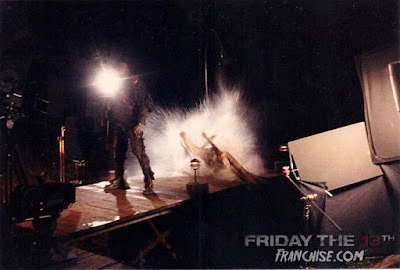 Check out fridaythe13thfranchise.com for some truly awesome F13 content! Originally today's post was going to cover Batman v Superman: Dawn of Justice but then I realized what day it was and pushed that to next week. There was just no way I could publish something on Friday the 13th and not talk about the ultimate franchise with its namesake. I'm also in the middle of putting the final touches on my book so the idea of putting something together that took any sort of forethought didn't seem very appealing to me. So I came up with a way to talk about my love for the series while also not putting any limitations on what to write about. Here are my random thoughts about the Friday the 13th franchise. Jason X gets far too much hate. There is absolutely no way that I could see myself saying this several years ago but it's become a favorite of mine in that it's just so much fun. Sure, it doesn't take advantage of one of F13's greatest assets, the camp, but it's still an entertaining time at the movies. I've been falling out of love with Freddy vs. Jason more and more every time I watch it. My younger self really enjoyed the roller coaster ride it takes you on but my older self just sees a big departure from the tones of either series. Rather than a blend of the two, it's simply an action/horror film with the two villains included. It's getting to the point where I may start to forgo it next go-around. I honestly believe that Part 3 is the clear-cut best of the franchise. Every time I watch it, I just see a unique move that stands out from everything else in the series. There's an odd lightness to the proceedings that contrast well with some of the darker tones that it's sandwiched between (I'd say 4 is definitely the darkest of the series). I consider the 2009 "remake" to be just another sequel in the series and I don't understand how others could possibly disagree. It follows along with the continuity of the series (as well as one can in the F13 world) and provides an vicious version of Jason. What else can we as fans really ask for? I remember loving every minute of it in the theater yet it's been almost seven years since we've seen anything like it get a theatrical release. C'mon man! Jason Lives is still probably the F13 movie that I watch the most. Anytime that I think "I could really go for some Jason Voorhees shenanigans" it's the first film that comes to mind. Even though it's a parody, it still hits all the right notes. I'm sure I'm in the minority but I think the original may be my least favorite not named Jason Goes To Hell. Don't get me wrong, I still get a kick out of the film, I just find it much more by-the-numbers and bland. It hadn't really found its identity yet and really plods along, just trying to get across the finish line more than anything. It could just be my resentment towards Cunningham and his treatment of the franchise, but I find it a chore to sit through. There are immediate improvements from Part 2 on and I think what F13 became was more of an accident than anything. A New Beginning makes for one helluva party movie. It's got the most kills in the series, and really makes no excuse for its sleaziness. It's everything you would come to expect from a F13 movie while also being so totally crazy and different that some fans hate it. I see it as harmless sleazy fun that needs to catch a break for having faux Jason. It's really not that bad. So the next time you have a Halloween party that just needs some horror visuals to put on display, I can't recommend this one enough.